The Place If you love value for money Chirashi Don, Sushiro should be a familiar name. Meet the one week old Omote, a modern and contemporary space located at level 3 of Thomson Plaza. This brand new concept is the brainchild of the previous Sushiro, which has ceased to operate as a brand and its previous locations in the same mall. My first thought when I entered Omote is the huge space, a welcoming notion as the previous Sushiro was way too small back when it first started. The interior does not feel so much like a Japanese restaurant, if not for the sushi counter seats and murals of Mt Fuji as a backdrop. You will also notice that there is a bar within the restaurant, which is quite rare for a “family” restaurant. In any case, it does make the whole vibe trendier and is possibly an aim to target the younger crowd. The Food As compared to its predecessor, the menu at Omote is much more extensive. 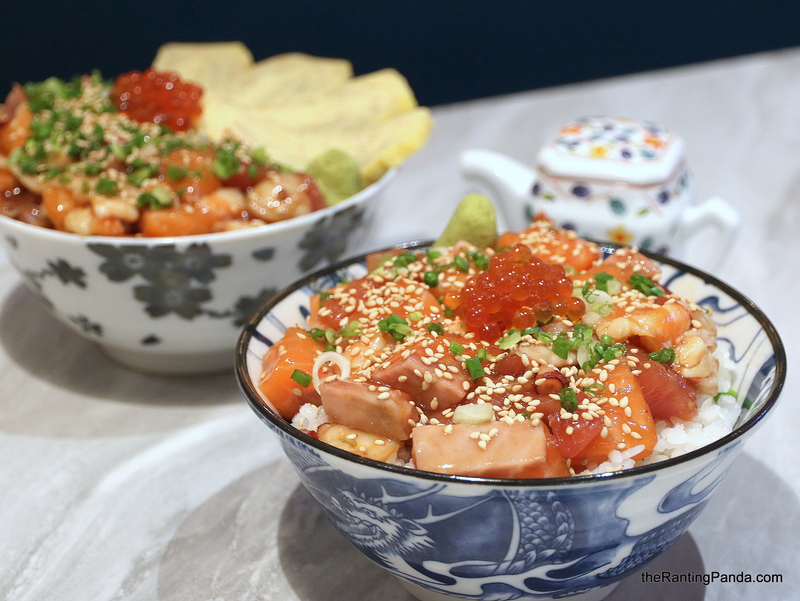 There are the donburi options such as Yakiniki don, assortment of sushi, sashimi, Japanese appetisers and of course, its famous Chirashi don. Interestingly, Omote is also looking to offer Omakase set meals in the first quarter of 2019. Think of it as a more fine dining concept within a separate space in the restaurant. In any case, prices are generally still kept affordable for most dishes. I started with the Crowd Favourite Sushi Set (S$15), an assortment of eight pieces of salmon, tamago-mentai, salmon aburi and salmon-mentai. The quality is very decent and you should have this if you love everything salmon. For mains, go for the Omote-Chirashi Don (S$12.80), where you get a good portion of diced seafood sashimi. The sashimi is quite fresh as I remembered it to be, and at this price, it remains one of the most unbeatable deals in town. Another variant of the Omote-Chirashi Don is the Tamagoyaki Omote-Chirashi Don (S$15.80), where you get additional slices of sweet egg omelette. Rants The hip music of Omote feels incongruent with Japanese cuisine, and the whole space feels loud in general. Something to note if you need a quieter dining ambience. Will I Return Again? With a more extensive menu now, Omote offer more than what Sushiro used to, although not all selections are as affordable as the cheap and good signature Chirashi Don. Will be back for more of this, and I am actually keen to try their Yakiniku Beef Don on my next visit, and probably more of their sushi. If you are looking for other cheap and affordable Japanese restaurants in Singapore, here is a list of some of our recommendations.